With events such as our festival, large amounts of waste are produced (enough to fill 4 large builders skips). The festival committee wants to ensure that recycling is maximised so that the minimum amount possible goes to landfill. This year we have appointed North West Recycling as our waste management contractor. 95% of the waste they receive is recycled. This means that plastics, glass and cardboard that end up in the waste bins at the festival, will all be recycled. 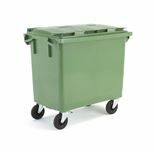 This year we will have plenty of wheelie bins within the marquees and the larger commercial bins outside the marquees and around the campsite. Please help us to keep the site clean by putting your waste in a bin. If you find a bin full please inform one of our volunteers who will be wearing a yellow festival T shirt.